NASA astronaut Karen Nyberg is readjusting to life with two feet on the ground. Nyberg just returned to the Earth's surface after spending more than five months living and working in space on the International Space Station. She landed in Kazakhstan on Nov. 10 in a Russian Soyuz spacecraft with European Space Agency astronaut Luca Parmitano and Russian cosmonaut Fyodor Yurchikhin. "The first 24 hours or so it was just difficult to walk without getting nauseous, but re-adaptation came very quickly after that once I got back to Houston," Nyberg told SPACE.com on Wednesday (Nov. 20). This isn't Nyberg's first experience with re-adaptation. She also flew a two-week mission on the space shuttle Discovery in 2008, and although it was a shorter mission than her space station stint, Nyberg is having an easier time readjusting to Earth-bound life this time around. "Even after my shuttle flight I noticed one of the first nights — when I was lying in my bed — I felt like I was on the wall hanging, looking down at the dresser that was on the wall, and I haven't experienced any of that [this time]," Nyberg said. Nyberg made the most of her time on the space station. 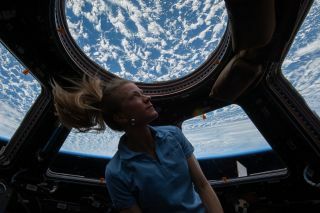 She used her Twitter and Pinterest accounts to send out photos of the Earth while she lived as one of six crewmembers on the orbiting outpost. "I love taking pictures of everything," Nyberg said. "In particular, clouds were always fascinating and maybe it's because they were always different. You see a lake, you see a river, you see mountains, but the clouds were different every time you traveled over. Particular storm clouds were spectacular, especially in low light and the various pictures you'd see in the cloud were just incredible. The cloud formations were just very beautiful." Nyberg beamed back videos showing snippets of her life in space multiple times during her stay on the station. She showed Earthlings how to wash their hair without gravity, and explained the finer points of the challenges associated with quilting in space. Nyberg sees social media as a way to engage people everywhere that may not know about the interesting experiments and activities on the space station. "It's an opportunity that we get and not everyone gets, and that's really not fair because it's so beautiful," Nyberg said. "It's something I think everybody should get the chance to see, but not only that, we're doing amazing things with space travel and studying and reaching toward boundaries that haven't been reached. It's important to get people interested in that."